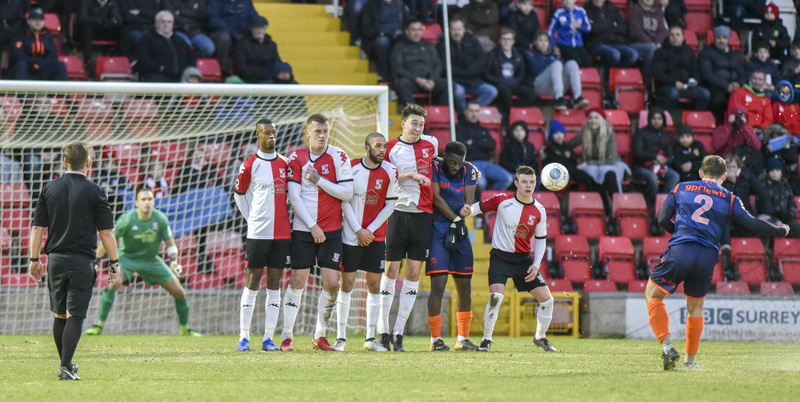 Woking’s impressive unbeaten league run was brought to an end with defeat at home to Wealdstone, completing the double of victories for the Stones. In wet wintry conditions, first half goals from Tarryn Allarakhia and David Pratt were enough to seal victory for the visitors. Woking who had been somewhat missing in the first half improved in the second half but still fell well short of delivering a threat. Max Kretzschmar returned to the side from injury as part of four changes to the starting line-up last time out at St Albans. Also called up into the side was Greg Luer, Paul Hodges and recent signing from Billericay Town, Rhys Murrell-Williamson, who started on the right wing. Attacking the Kingfield Road End, the visitors began the game on the front foot and it was not soon before the Cards defence were called into action. A through ball down the right led to a communication breakdown between Cook and Ross. This enabled Pratt to intercept and get a quick shot away. Ross had just enough time to recompose and block the shot for a corner. Moments later another through ball from the right wriggled past Casey and again found its way through to Pratt. As he collected near the goal-line the Stones striker cut in and shot from a tight angle. Ross remained alert and saved with his legs. After two early warnings the Cards remained second best and were punished in the 11th minute. This time Pratt became the provider as he collected a through ball in from the right and laid off a well weighted pass into the path of Allarakhia. The Stones midfielder took one stride forward after collecting the pass and coolly slotted the ball past Ross into the corner of the goal to give Wealdstone a deserved lead. Having scored early the visitors remained in control of the play. A ball over the top to set Allarakhia clear seemed to offer an opportunity for a quick fire double. However on this occasion play was stopped with a late flag from the linesman. However not too be undone, Wealdstone were rewarded with a second goal just two minutes later when Mensah came away from his marker down the left side and hit a fierce shot from a tight angle. Though somewhat unbalanced, Ross was able to parry the ball across his penalty area. The loose ball was collected near the goal line by Sheppard who calmly rolled the ball back into the path of Pratt. The Stones’ striker made no mistake with a first time finish beyond Ross to double the visitors lead. Having not been in the game until this point, Woking attempted to carve out a way back into the game. In what was to be their only chance of note in the first half Hodges managed to get the ball out from under his feet and embarked on a surge forward. Sensing Kretzschmar on his inside he laid the ball forward and having weaved towards goal the Cards top scorer rounded the goalkeeper before chipping his shot high over the crossbar much to the frustration of the Cards fans watching behind. After an uneventful close to the first half, the referee’s whistle to signal half time was met with near silence from the home supporters perhaps surprised at what had so far been an off form performance by the Cards. Perhaps disappointed with the out of sorts first half showing, Alan Dowson opted to make a change at half-time with striker Harvey Bradbury brought on to replace debutant Rhys Murrell-Williamson. Wealdstone began the second half as they had started the first, on the front foot. Sheppard got down the right side and clipped a ball in for Pratt to chase. As he advanced in from the right it looked like he may get a chance to score his second. However on this occasion the Wealdstone striker lost his footing at a crucial point and the Cards defence was able to collect and clear. In his first involvement since coming on Harvey Bradbury escaped from his marker on the left. He was able to play a ball back across the face of goal. Unfortunately the power on the pass was just a little too much for Kretzschmar who had read the play and made for the back post. Kretzschmar was soon after to be replaced by Nicky Wheeler as Alan Dowson looked for his team to push on further. Hodges collected a short pass in midfield and embarked on a mazy run down the right before shooting from a tight angle. North managed to scramble across and palm away for a corner. From the resulting play the Stones’ goalkeeper was able to collect despite being under pressure from Wheeler. Despite now being more in the game, Woking continued to look vulnerable to the counter attack. Wealdstone’s best attempt of the half saw Mensah taking a pop-shot at a loose ball which cannoned back off the crossbar with Ross well beaten. Had the ball perhaps been hit with a little less power this would almost certainly killed off the contest. As it was the Cards would get additional hope that they could fight back when Stones’ wing back Jake Sheppard was dismissed in the 71st minute for a second bookable offence after a heavy tackle in front of the dugouts. With the benefit of the extra man confidence grew amongst the home side and they thought the Cards had pulled one back when Gerring’s powerful header looked goal bound only to be acrobatically headed off of the goal line by Medford-Smith. In the final five minutes the Cards best chance to pull a goal back was thwarted by some astonishing goalkeeping from Jonathan North. A cross in from the right was again headed powerfully at goal from Gerring. Diving at full strength North managed to get a hand to save the effort. Jolley recovered the ball and sent another cross straight back into the six yard box. For a second straight occasion Gerring got up ahead of his marker though this time his header was straight at North. The Wealdstone goalkeeper smothered the loose ball and with it had secured the clean sheet and the victory for the visitors. Ultimately an off-colour first half could not be rescued by an improved second half showing and as a consequence the Cards found themselves having lost ground in their two-way chase with leaders Torquay United. For a second time this season they found themselves having come up against a dogged and determined Wealdstone side who raised their game and ground out a victory. Alan Dowson must now hope his Woking side can recover quickly as they embark on a tough run of league fixtures ahead starting next week with a visit to Oxford City. Man of the Match: Clive Walker’s MOM: Christian Jolley - Worked hard throughout the game to break up play and turn defence into attack. Got himself forward more in the second half and was involved in many of the attempts to get a goal back.